essence "snow jam" & "vintage district"
essence trend edition "snow jam"
Are you into skiing, snowboarding or taking a ride in a sleigh? 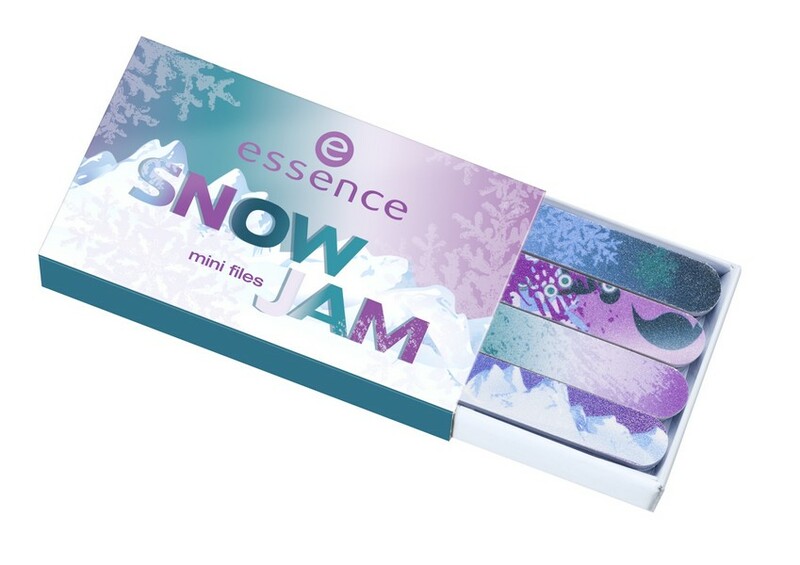 With the new trend edition "snow jam", essence fires-up all snow beauties in January and February 2013 – let’s head for the slopes! Sports, casual styles and evening après-ski parties are sure to put us in the mood for wintertime! The colors of the "snow jam" trend edition look great with trendy ski and snowboard outfits: the combination of bright purple, turquoise and petrol as well as frosty pastel shades creates a cool make-up look and a great mood is guaranteed all round! Pampering shouldn’t fall short when you’re having fun in the snow at icy temperatures. That’s why the products in this trend edition skillfully unite wintery colors with valuable ingredients. Eyes cream! The eyeshadow sorbets in petrol, light mint and soft lilac offer your eyelids a light shimmer. The creamy texture makes it easy to apply smoothly with your fingertips and it lasts all day long – for ultimate ski fun! Available in 01 lilac is my style, 02 top of the ice-stream and 03 life is a freeride. On the slopes during the day – time to party at night! The jumbo duo eyepencil is an ideal team for eye make-up and can handle hours of action! One end is a kajal, the other a highlighter with glitter effects: this eyepencil lets you create the right look for every occasion. Available in 01 let’s hit the slope and 02 petrol snow-queen. Color and care… just the right thing when it’s freezing outside: the moisturizing lipbalm in two cool shades with subtle color dispersion. It pampers your lips with high-quality castor oil and leaves behind a wonderful fruity fragrance. Available in 01 lilac is my style and 02 goofy-blue. Frozen nails! 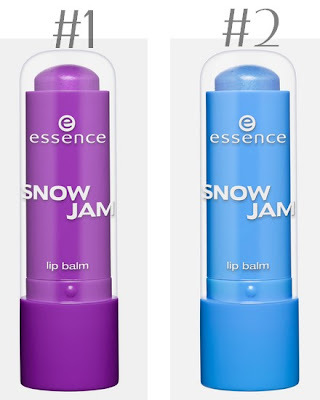 The four bright colors of this nail polish are sure to be true eye-catchers at any après-ski party: cool and icy blue, snow white, petrol and purple. The lighter shades have a shimmer effect while the intense shades are plain. Thanks to the long-lasting, innovative texture of the nail polish, application is easy and fast with just one stroke of the brush. Available in 01 goofy-blue, 02 lilac is my style, 03 life is a freeride and 04 top of the ice-stream. These are sure to fit into even the tiniest pocket and shouldn’t be missing when you’re on the way to the ski lifts: the small nail files in a practical packaging are ideal when you’re on-the-go and ensure super stylish nails at all times! Available in 01 snowboard-girls rock! Icy sub-zero temperatures are a real challenge for your hands. Pampering ingredients like rich shea butter and valuable coconut oil replenish chapped, stressed skin with intense moisture. 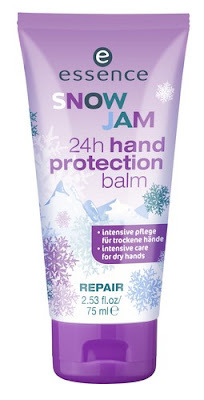 The tried-and-tested 24 hour repair formula provides long-term protection for hands soft enough to caress. And it pampers has a delicious fragrance, too! Available in 01 keep cool! 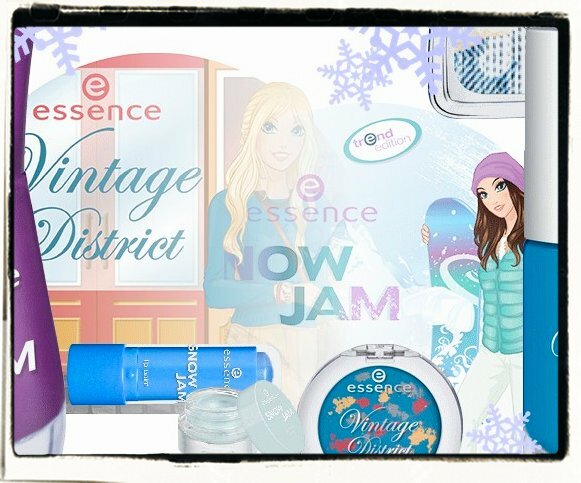 essence "snow jam" will be available in stores in January and February 2013.
essence trend edition "vintage district"
Cool hippy attitude meets bohemian chic and street style: the new essence trend edition "vintage district" spreads the flair of the fashion hotspots around the world in January 2013. To be found in many big cities: art districts with unique and individual shops where the trends of the past come back to life and merge with new styles. Retro colours like rusty red, petrol, grey, peach and brown as well as products with a vintage appearance put you in the mood for the treasures of past generations. The duo lipstick & gloss in two intensive colours and the nail art decoration kit for lots of creative and extraordinary nail designs are the absolute highlights of this trend edition. Used and amused! The three highly-pigmented eyeshadow colours stand out for their gentle as well as long-lasting texture and are simply fun to use. The speckled look in another colour from the trend edition turns each eyeshadow into an absolute eye-catcher! 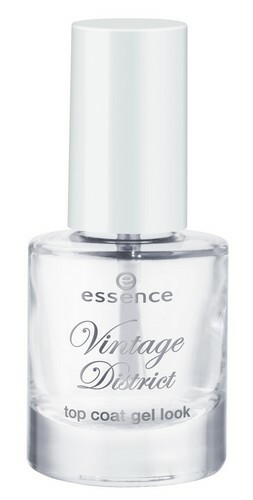 A pure vintage feeling is guaranteed! Available in 01 I'm so retro, 02 shopping @ portobello road and 03 get arty. Colour-intense in turquoise and grey, the gel-cream texture of the eyeliner ensures an accurate line and is easy to apply thanks to the brush included in the set. The ultimate duo for individual eyeliner styles. Available in 01 shopping @ portobello road and 02 get arty. Unique lips! The duo lipstick & gloss is a true must-have and so practical: two textures of the same colour united as a combo-product ensure ultimate colour fun! 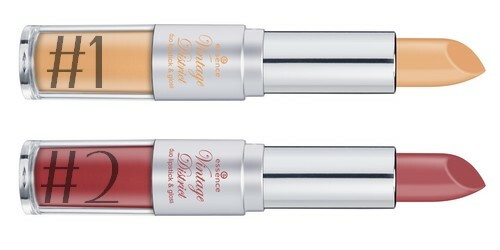 The creamy lipstick texture can either be used on its own or as a basis for the gloss. And the gloss is also a superstar, no matter whether you use it alone or as a topper! 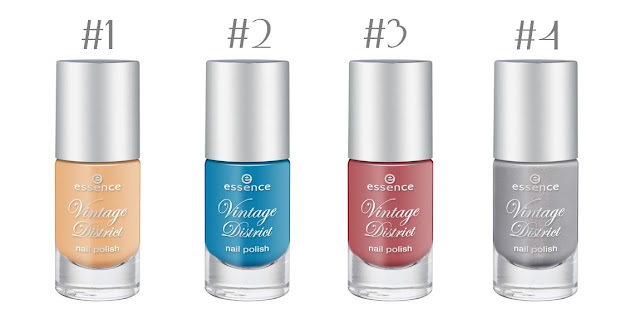 Available in 01 vintage peach and 02 antique pink. Way back then or right now, fashionista or bohemian queen: everybody wants a perfect complexion! 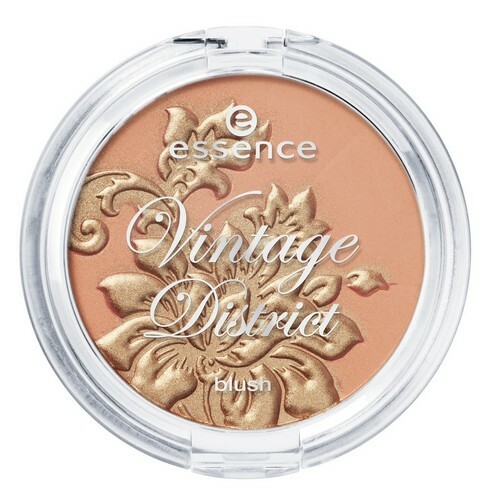 The soft peach base colour of this multi colour blush ensures a fresh look while the flower decoration with golden shimmer creates gorgeous highlights to complete the bohemian look. Available in 01 it's popul-art. Antique treasures! The four retro colours of the nail polish are sure to put you in the mood for a trip to the past. Peach, rusty red and turquoise are plain and grey comes with a light shimmer. Applied on their own or as a base for the decorative elements of the nail art decoration kit, they conjure-up a hint of nostalgia on your nails. Available in 01 vintage peach, 02 shopping @ portobello road, 03 antique pink and 04 get arty. Shiny nails: the high-shine top coat gives your nails a popular gel-like finish and is ideal for sealing individual nail-style creations. Available in 01 shine like new. Individualists: do it yourself! 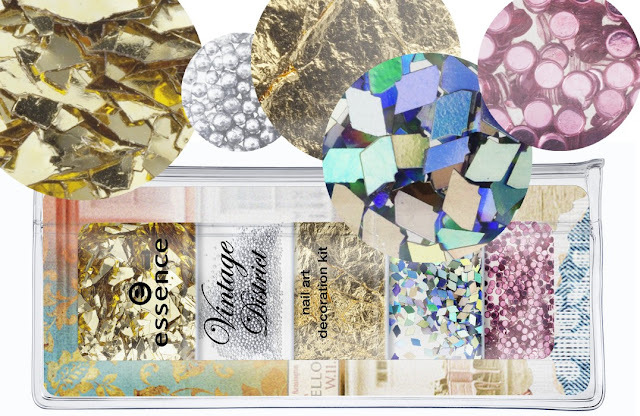 It’s easy to create unique nail designs with the two versions of the nail art decoration kit. 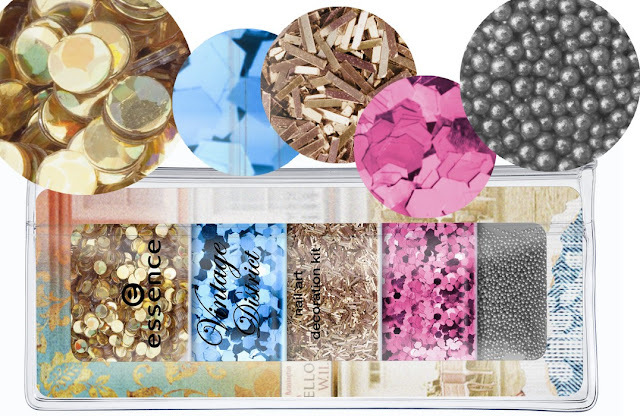 Whether you go for glitter, flakes or pearls – there is no limit to your imagination for a guaranteed wow-effect! Available in 01 something g-old - something new and 02 designer for a day. essence "vintage district" will be available in stores in January 2013.